Reyaaz Mulla took home the first prize of amount £58,300 by winning 2 2016 GUKPT Manchester Main Event. Mulla defeated Tom Middleton, who made £53,000 and was runner up. Reyaaz Mulla, the winner took home (£58,300).Tom Middleton was runner up and got£53,000, Ming Ju made £27,600 and stands at third place. Fourth, fifth and sixth positions were for Darren Lord (£18,100), Grant Wheelhouse (£12,550) and Matt Davenport (£9,065). Whereas the seventh, eighth and ninth places belongs to Priyan De Mel (£7,400), Tuan Lee (£6,300) and Andrew Mathews (£5,300). The game started with 90 players but ended to 16 on Day 2 of the Manchester Main event. Mulla was leading top 16 players and was playing really well and ultimately topped the field size for an amount take home £58,300. Before this a regular guy of GUKPT, David Maudlin got busted after 70 minutes of play took place in nature. He finally got out empty handed. Michael Ermie has won the $1,115 buy in regional Main event at Hollywood Poker Open Toledo. He defeated Bruce Peery, who made $50,000 at the event. The tournament attracted 323 entries. 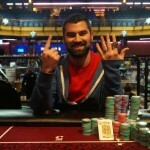 Michael Ermie won the Hollywood Poker Open Toledo $1,115 Regional Main Event. He topped a record-second field of 323 entries for an HPO regional main event and earned $60,017 in first-place prize money. Life time earning for Ermie exceed to $200,000 now, which seems to be a very good total. Michael Ermie wins the championship for amount $60,017. The runner up was Bruce Peery with total $50,000.Nick DePalma collected $46,019 and was at third place in the tournament. Whereas the fourth and fifth places were for Jason Orrell ($21,964) and Zach Andrew ($16,473).